It’s a 2012 “Big Thing” – The Dalai Lama Talks Poop | "It's Not Wine, it's Mommy Juice!" The Dalai Lama came to Hawaii this week. It was perfect timing for me. I had decided that each month I had to do a “big thing.” Something that was extraordinary. Something that was Post-Paris Kristine. Something that mattered. I think seeing the Dalai Lama counts. It was mighty kind of him too, to schedule his trip right when I needed it. He is very fond of George Bush. They like the same kind of cookies. But knowing that person is a good person does not mean that you agree with them all the time. A person’s motivations can be good but their method is unrealistic so the goal is not achieved. The key to inner peace is warm heartedness. Develop your own practice, your own views, your own convictions so that when everything around you is negative, you can remain strong and influence your environment. Fear can be realistic (dangerous dog coming at you) or unrealistic. You can deal with unrealistic fear by being open so you can create possibilities and see what happens. The best part of his talk was the Q&A. A person asked him if he smiled all the time, even when he was not in front of cameras. He said, yes. Then he added he smiles even when he is in the bathroom. Yes, he said that! I’m paraphrasing because I wouldn’t be so presumptuous as to quote the Dalai Lama from memory. But I swear to Buddha (can you do that?) he said it. His Holiness pretended to squat over a toilet with a grimace! Uh huh. That’s what he did. On stage. I swear on all that I hold holy. !!!!!!!!! I kid you not. The same person asked another question. How happy can anyone expect to be? 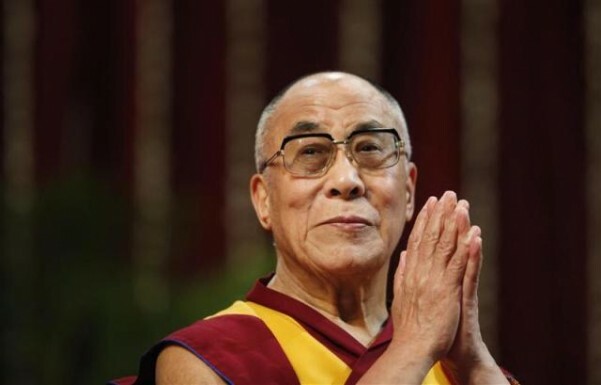 The Dalai Lama answered that any event has many angles from which it can be viewed. The problem is that human beings tend to look from only a single angle. Therefore, we miss the joy and good that can come from the bad things. He instructed us to use our intelligence to look at things from different angles. Yada yada yada. I had stopped listening. The Dalai Lama, one of the greatest men living on earth, had just pretended to take a poop on stage. And I was there to witness it. Below is a video from Pillars of Peace. In it, His Holiness talks about the power of Aloha, and the fact that he didn’t know what the word meant at first. This entry was posted in It's a "Big Thing", Mad Ramblings, There's Video! and tagged Big Thing, religion by Kristine Castagnaro. Bookmark the permalink.